What greater thing is there for two human souls than to feel that they are joined together-to strengthen each other in all labor, to minister to each other in all sorrow, to share with each other in all gladness, to be one with each other in the silent, unspoken memories? We welcome requests from couples (heterosexual, gay or lesbian) who are not Congregation members, and who are searching for a minister for their wedding or life partnership ceremony. Of special note: We realize that many gay and lesbian couples have been together and committed for a very long time. Whether you wish your ceremony to be designed and called a wedding, or a re-commitment ceremony, we are pleased to help you create it. We work with couples to design their own unique ceremony that speaks of their relationship, dreams and commitment. We also encourage couples to contribute their own ideas, and to involve friends and family members in their ceremony. 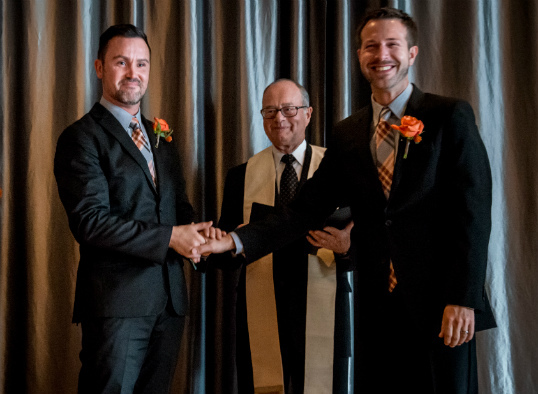 We are proud that our religious tradition has decades of commitment to gay and lesbian couples, officiating life partnership ceremonies. Our congregation worked long and hard for the civil right to marry for everyone, and we are delighted now to officiate legal weddings for all! Unitarian Universalists are committed to bringing about full legal and civic equality for all loving couples in all states. In the meantime, we are also delighted to officiate for out of state couples. All couples may contact us to arrange a time to meet and to explore further, including how we would work with you to plan your ceremony, and appropriate rental and minister fees. Ceremonies can be in our church sanctuary or somewhere else in the wider community. Contact us for more information.